The Grey Heron is an omnivore that increasingly loses its shyness. The bird is seen more and more in towns and villages, where it hunts for fish, frogs, mice, in fact all the food it can get. Characteristic is its slow way of walking through the water. The Grey Heron doesn't have black on the neck. 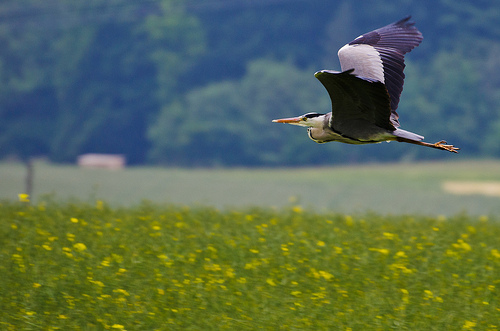 Also a Grey Heron flies with its neck folded back, the Crane keeps its long neck extended. 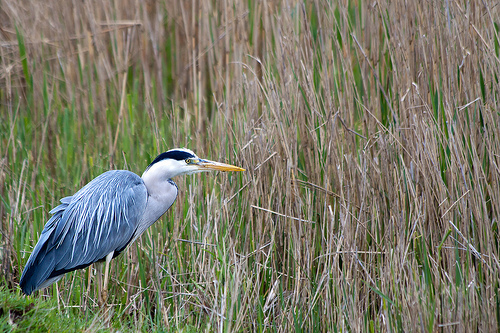 The Grey Heron has a grey or blue-grey appearance, the Purple Heron is reddish brown.